Since Mobile devices are getting hotter ever hour as we move into 2013, should businesses take advantage of mobile devices in their websites? Does a business need to create a Search Engine Optimization (SEO) approach to leverage mobile in addition their regular website SEO? The answer to both questions is most definitely YES. 3) Extend your social media footprint. Get even more content marketing results by combining Mobile SEO, YouTube SEO, and Social Media SEO efforts. Mobile users are searching for content that is mobile friendly. Business owners can step ahead of their competition early in 2013 by making updates to their websites ahead of their competition. With less than 10% of today’s websites that are mobile friendly, a business can definitely get ahead of competition by starting now with their own mobile solution. But beyond creating a mobile friendly website, what does one do to attract searches and get real customer results? That is where a basic Mobile SEO strategy is needed. A great article by Bryson Meunier- “Mobile SEO is Not a Myth…”, suggests Mobile SEO ideas for a mobile unique environment to enhance Mobile SEO performance. Knowing how search results are different between desktops and mobile creates a business advantage for mobile friendly websites. Google keeps making changes to search parameters as they try to enhance the searchers experience. Savvy business owners will need to keep one eye on Google changes, and another on their smart phone search results. Mobile SEO adjustments are not needed daily, but over a period of time, as analytical data provides the measured results for making strategic updates. Also knowing how Mobile SEO can take local SEO to a new level of interactivity can help some business verticals; particularly where the business needs to build its local market reach. Mobile smart phone users often commute and travel to different cities. As an example, a salesman or other traveler may be looking for a restaurant, gas station, or local entertainment spot- and these searches might be added to the base mobile devices living in a particular area. Being able to target searches from a local area gives businesses an ability to capture potential customers coming into an area- much different than targeting only local desktop searches. In addition to Mobile SEO, one might also investigate including Mobile Paid Search ads, with your Mobile SEO solution to enhance your search results even further. Because there are so few websites that have been converted to mobile friendly solutions, Mobile paid ads can give your mobile website a real advantage while your competition is playing catch up in 2013. Take advantage of the window of opportunity that Mobile paid ads can bring, before your competition recognizes the need to even have a mobile website. YouTube is the second largest search engine next to Google this according to an article on 5 Essential Tips for Your YouTube Channel. Adding fresh new SEO relevant video content to your web solution can enhance your Mobile SEO results. Although YouTube is still building its SEO relevance, 2013 will be the year to plan to add quality video SEO content to your web solution. Make sure that your video content is also Mobile SEOfriendly, which will further distinguish your web solution ahead of your competition. YouTube videos are playing a larger role in creating relevant, fresh, quality, entertaining content for SEO search engines to find. Combining mobile searches and video SEO opens up new opportunities for businesses to stay ahead of competition in search results. Not only does YouTube rate as a fresh new SEO source for your website, it also plays highly into search results for social media content. Although in some rating systems such as Nielsen, YouTube may not be considered as a social media entity. See SEO for YouTube- Best Practices to get a basic understanding of what steps a business needs to take with SEO practices for your YouTube Videos. It is not just a simple matter of uploading videos, but steps are required to enhance your video’s SEO search position. Consider producing your videos in High Definition quality, because this improves your YouTube rankings. Video tags are also very important part of building your YouTube SEOposition. Mobile Internet users are overtaking wired Internet users in the next couple years, but the shift is happening faster for Social Media, this according to an article by Hootsuite CEO, Ryan Holmes. Social, Local, and Mobile (SoLoMo) is a term people will be hearing more often in 2013. Social networks sharing location information from their mobile devices, is becoming integral part to some social media environments. Certainly Business to Consumer (B2C) retailers will find new opportunities in 2013 to provide innovative offerings to consumers through SoLoMo. When creative offerings become accepted as part of the social media mind set, then SoLoMo will become a standard for new business opportunities in 2013. Social Media is not just a capability for B2C, it also is starting to be more relevant in the business to business (B2B) market place as well. Turn the social media noise into music is a YouTube video about social media geared to a B2B scenario. Like most other website enhancements, Social media itself provides a significant stride forward in your web solution. However the real pizzazz for 2013 is to combine social media with your SEO approach. See an article – SEO and social media get married, which discusses what happens when SEO and social media join forces to build a strategic approach to content marketing. 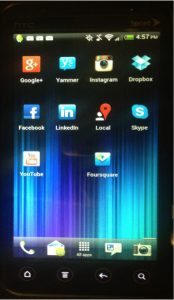 A mobile website solution is a great idea to enhance your website for 2013 and Mobile SEOshould be a natural extension. However, taking further content marketing steps to enhance your Mobile website solution with Social Media and YouTube videos will leave your competition wondering what happened to their website. And don’t forget to follow SEO best practices for each enhancement. Mark Colestock, a digital marketing strategist at WSI DigNet, helping businesses with their online marketing needs. There’s probably about a dozen other clichés marketing agencies can use to describe how the search engine giant plays the tune and we just dance to it (see, there’s another one). For years digital marketing firms have been playing cat and mouse games with Google. The factors that the search engines use to determine where a website should be ranked in the search results were just too easy to be manipulated by those of us who made a career of it. Some of us played by the rules (white hat SEO) and some of us “bent” the rules (black hate SEO). Search engine marketing is no longer about Websites; it’s about “Web Presence”. Search engines have decentralized the criterion they use to decide which Web pages rank where for what keywords. At the end of the day, search engines look for the same thing that people look for…content that is related to what people are searching for at any given time. You have to optimize, produce and manage content that is not only designed for search engines, but is relevant to your target market. You will have to do extensive keyword analysis to determine the optimum keywords to ensure success. The most popular keywords are not necessarily the best. We prefer to target “niche” keyword phrases that relate directly to your target market. Targeting multiple highly relevant phrases will allow you a better opportunity to obtain higher rankings across more keywords that are directed to people farther down the buying cycle. (As opposed to targeting fewer harder to obtain “general” phrases). The output of almost all Website platforms is HTML code. It is the basic building block of the Internet. Other code such as Java script or Flash is a barrier to search engines indexing your Website. You will need to ensure that your Website is built on a search engine friendly platform. Adobe’s Business Catalyst platform, WordPress, and basic HTML are always good choices. There are plenty of others as well. A search engines’ goal is to display the best “user experience” they can find. That means that the actual structure of the website is a major factor in determining where your website will be placed on the search result pages. Also consider how many clicks it takes for a visitor to get to any of your pages on your site. If it is more than 3…it’s too many. It’s annoying to your visitors, and search engines recognize that. People don’t wait more than a few seconds for your Website to render before leaving, and neither do search engines. Make sure that you use high-speed hosting and a site design that is not heavy with extraneous code which slows down the Website. Search engines factor both internal and external links. Each Website, directory or social property that links to your site is considered a “vote” for your Website. Why else would someone link to your site unless you provided valuable information? It is important to note, that not all links are created equal. Some incoming links are more valuable than others. Search engines also factor “Internal Linking Structure’ (pages on your site that link to each other). Linking unrelated pages can be detrimental to your efforts. However linking relevant pages strategically in a “silo” structure will increase what we call “link juice” and consolidate the relevancy of your keyword themes. Search engines love blogs because by their very nature blogs are updated frequently…and search engines like fresh relevant and original content. Blog posts are indexed relatively quickly and are treated as a Web page of information by the search engines. Search engines rank Web pages… not Websites. You will want to ensure that your blog posts are designed to rank for specific keywords, but not at the expense of your human visitors. No longer just a buzzword, search engines factor what they call “Social Signals” that indicate that you are interacting with your target market (thus indicating that you are relevant). Aside from the obvious advantages of interacting directly with your consumers and driving traffic back to Your Website, best industry estimates are that Google factors between 9% – 14% of their search ranking algorithm based on social signals. Analytics must be distilled into a meaningful report that can be analyzed to show trends and progress without all the noise of the raw data. 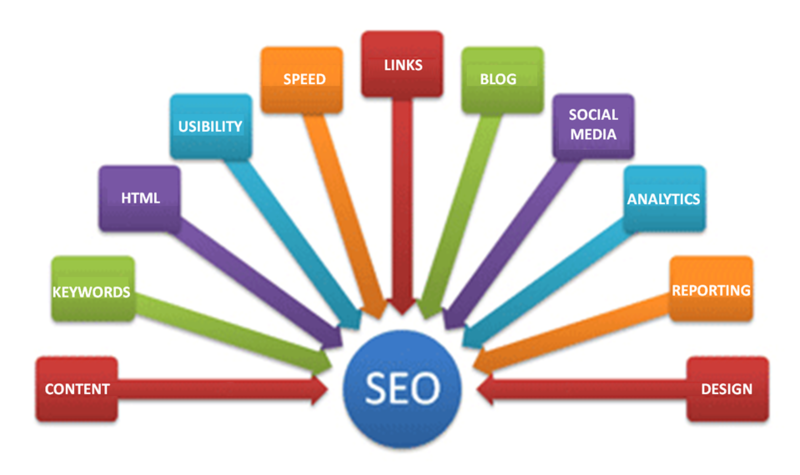 These 11 factors are just the main ingredients that go into search engine optimization. They don’t even address other aspects of an entire Web Presence Optimization program that includes profiles and pages from LinkedIn, Facebook, twitter, and reviews on Google+, and Yelp and Citysearch, etc…. At the end of the day, its Google’s world, I just live in it. One-time search engine optimizations are rarely effective unless they are for a localized “niche” or non-competitive market that is tightly geo-targeted (like a chiropractor doing business in a single town). Just putting your meta-tags into the code is still considered industry best practice, but in actuality has very little influence on how search engines rank you. Content: Search engines look for lots of balanced content. Their theory is the more content about a certain subject, the more of an authority you must be. It is not just sheer quantity of copy (although that is a factor), but the quality of the copy which has more impact. The search engines look at “keyword Density” or the ratio of keyword usage to total volume. The content has to be written very specifically and focus on no more than 1-3 keywords maximum. Internal Linking Structure: Search Engines want to be able to “spider” the entire website by following the links from one page to another. We use a “silo” structure to leverage all the focus onto the Home page or landing page. Although I have to admit that recently even these pages are starting to rank independently (so they have to be more than SEO pages, they have to be marketing pages as well). External Linking: The theory is “the more people who link to you, the more of an authority you must be”. Each link is essentially a vote for your website. However not all links are factored in. only quality links really move the needle. Quality links are links from other high ranking websites and directories. Reciprocal links (linking back and forth to each other) do not count nearly as much. They don’t hurt, but they don’t help as much as you think. Consistency: Search engines reward consistency and penalize blatant attempts to manipulate them. This is a major factor in why one-time optimization events are largely ineffective. If you suddenly flooded your website with content and links that appear to come out of nowhere, the search engines will find that unnatural and flag you. We typically put together a “content blueprint” that actually defines what is to be done and when. How many pages of content, how many blog postings, how many incoming links will be solicited, how many customer reviews we can cultivate, etc. If you need instant traffic, turn to Pay-Per-Click (PPC), it’s the fastest surest technique for driving traffic. If you want long-term value, be prepared to engage in a Search Engine Optimization program, not just a SEO event. Pay-Per-Click (PPC) search marketing and search engine optimization (SEO) are two different strategies for achieving the same result: driving targeted traffic to your website. There is a common misconception that these strategies are independent of each other, often resulting in a search engine marketer relying completely on one method at the expense of the other. Each method has its advantages and disadvantages. PPC drives faster results in terms of pure traffic because you have a tremendous amount of control over everything from the placement to exactly how the search result will appear to the searcher. The disadvantage of PPC lies in its reliance in one specific factor… your advertising budget. The less money you spend… the less traffic you get. SEO on the other hand is the most cost-effective, long-term solution because after the initial optimization (and some on going maintenance) your site could benefit from free traffic for an extended period of time. The challenge wit h SEO is that it requires a huge amount of initial research, diagnostics and optimizations to be successful. Even then SEO results are unpredictable because search engines are constantly updating their algorithms, and your competitors may be launching similar efforts to pursue those coveted top spots on the search results pages. The contrasting differences between SEO and PPC can be leveraged into a comprehensive online marketing campaign. In fact, we often use PPC to monitor the results to help us with our keyword research to prepare our SEO program. With the help of a professional who knows how to leverage both strategies you should be able to drive long-term, cost effective SEO traffic and immediate, targeted paid traffic.